India is not known for high Internet speeds, be it on mobile or through broadband. But that had not stopped users from viewing streaming videos on mobile. According the mobile analytics report released by Bytemobile, about 50 to 60% of the total mobile data traffic is consumed by Video alone! Only about 25 to 30% of data usage is consumed for pure web browsing and about 15 to 20% is used for other activities. It is interesting to note that majority of data traffic generated by users on Android & iPhone Operating System along with people using Laptops (with mobile wireless connectivity). 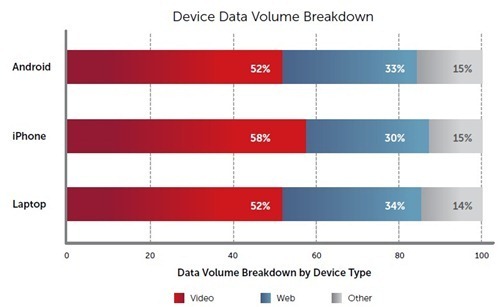 As far as the Video resolution goes – 29% of users consume high-resolution videos (28% use 480p & 1% use 720p) but they account for almost half of all the video data traffic. Conversely, about 40% users consume videos in 240p resolution but they account for only 1/5 of total Video data traffic. Subscribers that access the YouTube website via a mobile browser are served higher resolution videos than subscribers accessing the same videos through the preinstalled YouTube application, regardless of the network or device type. 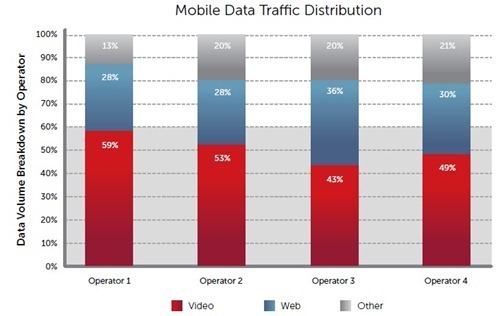 Dependent on network conditions and time of day, mobile videos stall between 5 and 40% of the time. Video optimization technology reduces stalling by 30 – 50%. Subscribers on wireless networks optimized for video consume double the mobile video content than those on un-optimized networks. Download Mobile Analytics Report here. 11 Fundamental principles for successfully bootstrapping your startup! Katrina Kaif most searched term for Mobile Videos – Anna Hazare 7th!